P5/6/7 took part in the Eco Schools Scotland One Planet Picnic Pocket Garden competition and designed a Pocket Garden in pairs. The garden had to be eco-friendly, use seasonal produce, be grown locally and have a theme. 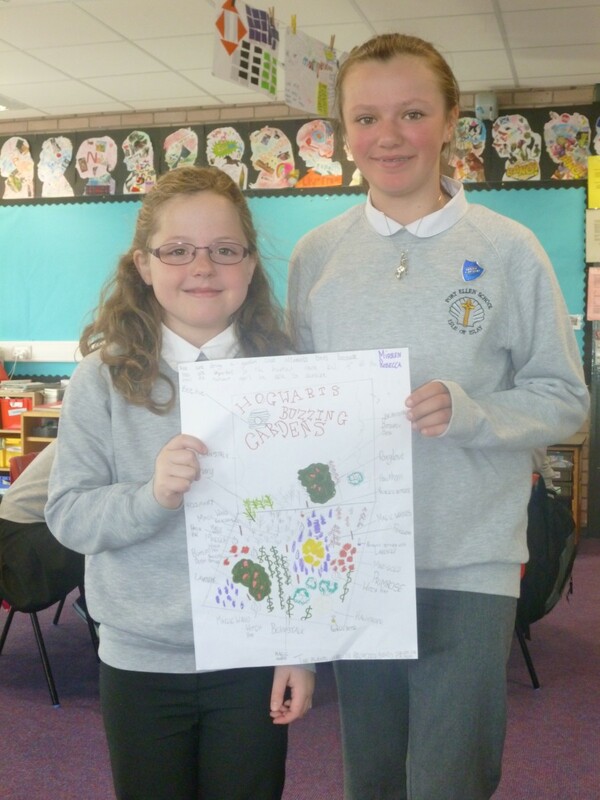 Mirren and Rebecca’s Hogwarts Buzzing Garden came back as a winner! They had a Harry Potter themed Garden that is bee friendly which they now had to create and take to Edinburgh for the Royal Horticultural Show at the start of June. After they found out they won they went straight to work with finding, making and growing different items to put on there garden. Mirren, Rebecca, Mrs Clar and Mrs Leask took a trip up to Glenegadale Garden and Peter to source some locally grown plants for the display, which he generously helped us with. We think the final garden, which has plants to help with spells and help attract and feed bees, will look great. Thanks to everyone who is helping to make it possible, including our mums and dads who are taking us. Well done girls! Your design looks fab, can’t wait to see it all put together.